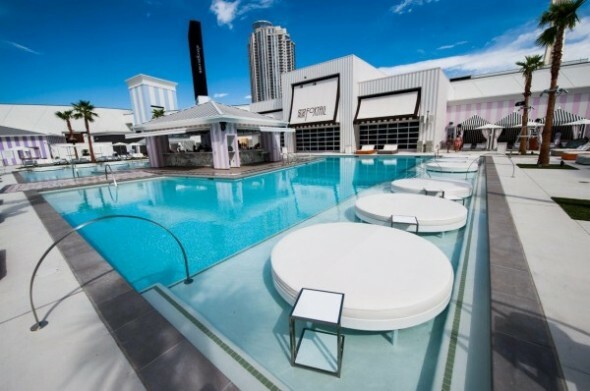 The Foxtail located at SLS casino and resort is brand new retro-inspired nightclub that takes up 43,000 square feet with a pool bar connected to the inside. You can lounge around during the day in one of the 25 cabanas, two VIP cabanas, 30 daybeds or “floating” lily pads while catching rays. However, the fun really starts if you stick around until night when the wall of the neighboring parking garage and hotel tower turns into a canvas for a 3D show. The pool party at Foxtail has showcased some of the most beloved EDM artists such Gareth Emery, Rebecca & Fiona, R3HAB, and Borgore! In the midst of the modern vibe that SLS has created for itself, Foxtail, stands like a glass door to a perfect vintage styled wonderland. Foxtail is an emblem of high class and poise. The fact that Foxtail is open at somewhat infrequent helps add its exclusive allure. And the lists of famous performers who’ve hit the stage is reason enough to pay attention. With a street art feel, intermixed with the latest LED tech and all the bells, whistles and subwoofers you’d expect in an upscale club, Foxtail is fitting in nicely with SLS’ already impressive nightlife events . It stands out as the exceptional spot reserved for single nights and special events. The Foxtail offers surprisingly impressive accommodations for anyone looking to throw the perfect party for a newlyweds after party to an elegant work gathering. If you love the modern SLS style, and you want something more exclusive than LiFE or Sayers Club, hit up Foxtail. It has quickly become a favorite spot to party at for tourists and locals alike!